Maintaining a healthy balance of microalgal species remains as one of the most common—and challenging—tasks for the marine aquarist. 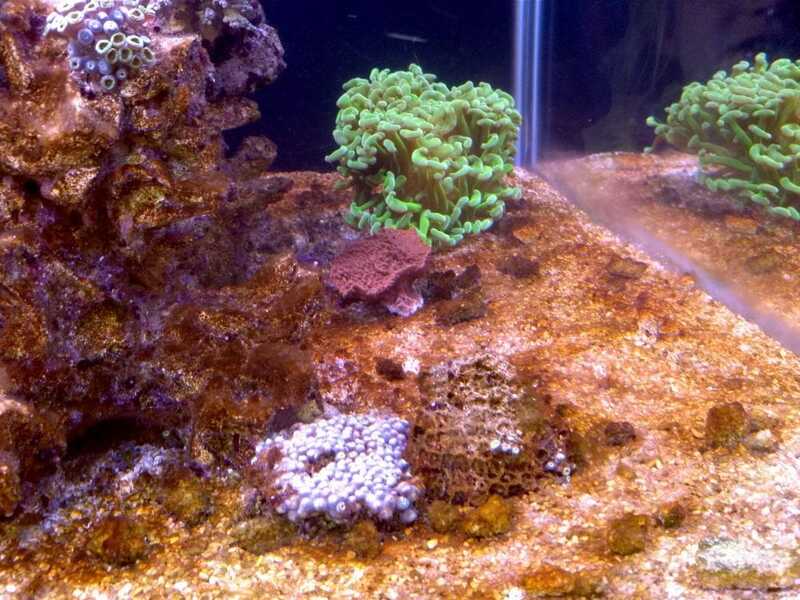 Not only can marine aquarium systems be far less chemically stable than the natural reef environment, but they are also subject to disturbances that can occur following bouts of overfeeding, decay associated with animal deaths, chemical water treatments/medications, increases of bioload, and so on. Many of these problems are directly associated with excessive nutrient concentrations. The waters that support coral reefs are typically nutrient poor, which is exactly why healthy reefs are typically free from smothering by benthic forms of microalgae. On the contrary, closed aquarium systems can quickly accumulate these nutrients, leading to unsightly algae blooms and even the poor health and death of aquarium inhabitants. It is therefore imperative that some means be taken to mitigate the inevitable decline of water quality. Surely, large and frequent water changes are a highly effective way to address these issues in the short term. However, as they are costly and time consuming, they are a less than ideal long-term solution. Chemical filtration, while helpful, is similarly expensive and can have the unintended consequence of removing beneficial substances. Algaecides are almost universally frowned upon in the aquarium community (and rightfully so) as they can eliminate beneficial flora as well as harm (particularly in reef aquaria) some delicate invertebrate species. Fortunately, many hobbyists have begun to experience considerable success taking a more natural and decidedly gentler approach—adding live, beneficial microalgal products to their aquarium systems. In addition to providing important nutritional supplementation to many aquarium species, this method safely robs undesirable algae species of excess nutrients as they build up. Notably, this tactic has been reported to eliminate some of the most loathed forms of nuisance dinoflagellates. The order Dinoflagellata is quite ancient and diverse. It is worth noting that not all of its members are harmful in the aquarium; indeed, dinoflagellates of the genus Symbiodinium (referred to as the zooxanthellae) are well-known for their important mutualistic association with reef-building corals. Furthermore, dinoflagellates are one of the most represented groups among the marine plankton where they contribute significantly to local food webs. 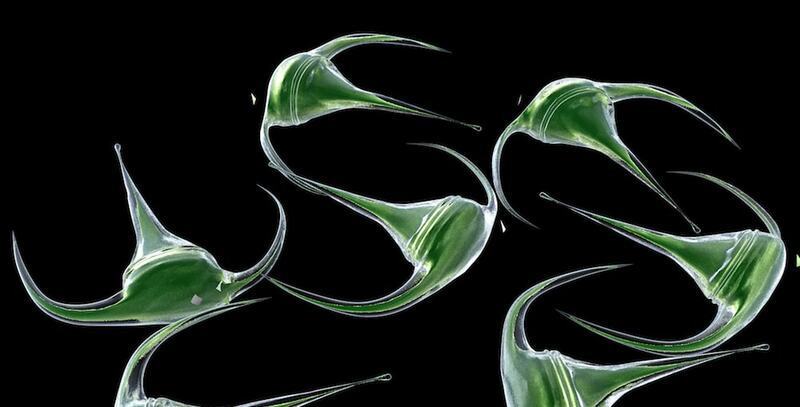 The roughly 1,000 dinoflagellate species are rather difficult to classify. They are generally placed into a group of flagellated protozoa called phytoflagellates. Zoologists tend to classify phytoflagellates strictly as protozoans, whereas botanists consider them to be true algae. This confusion is understandable, given their simultaneously plant-like and animal-like characteristics. They appear to be the product of the mergence (i.e. endosymbiosis) of a primitive protozoan and a photosynthetic bacterium. This helps to explain why some types (most, in fact) are photosynthetic while a few are heterotrophic (that is, eat stuff). The heterotrophic forms are actually quite weird, and can grow rapidly in aquaria where there are high concentrations of dissolved organic compounds. Some heterotrophic varieties can even ingest solid food particles through a “mouth” that is formed from a gap at the anterior part of the body. In some cases, such “particles” include other types of dinoflagellates. Dinoflagellates are exclusively unicellular, though there are some colonial types can form long chains. All possess a pair of flagella (one short, one long), for which they are named. 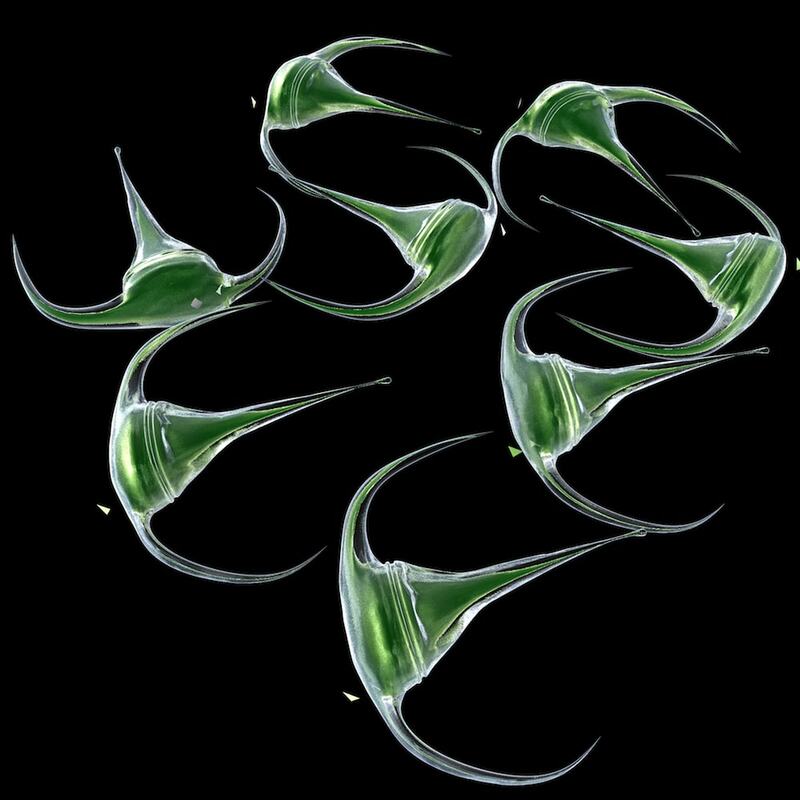 The flagella project from grooves along their bodies and are used primarily for locomotion. While a few are colorless, most dinoflagellates possess yellow or brown pigments. Their bodies may be either naked or covered with a membrane or plates called theca. The theca are composed of cellulose and are sometimes heavily silicated. These tough membranes and plates serve as armor that protect the dinoflagellate from herbivores. Further protection is sometimes afforded by the production of noxious chemicals. Genera such as Gymnodinium and Gonyaulax produce especially potent toxins such as those responsible for red tides (i.e. saxitoxin). Due to their strong defenses, dinoflagellates may be completely unpalatable and duly avoided by typical aquarium algae-eaters. Making matters worse for the aquarist, dinoflagellates are often capable of extremely high reproductive rates and adaptability. Some types can reproduce (usually via binary fission) multiple times per day. When conditions are not favorable, they are also capable releasing spore-like resting cysts that can regenerate at a much later time. This makes completely eliminating them, particularly without intensive and long-term treatment, very hard to accomplish. Some try some “cures” such as manipulating pH or alkalinity to no avail. Some try to blast it off of the rock, only to see it spread more rapidly. Some even play with fire by adding potentially harmful chemicals such as hydrogen peroxide to the aquarium water. Could it be that the best means of ridding a tank of even the most persistent dinoflagellates (such as “brown slime algae”) are actually the most natural means? It should seem that the best way to eradicate nuisance dinoflagellate blooms is to put a stop to the problem that allowed them to arise in the first place—excess nutrients. As mentioned earlier, the safest and surest course of action here is to increase competitive pressure on them by increasing the densities of beneficial algal species. The enlightened aquarist can carry out a highly effective multi-pronged attack with the use of high-end live algal products such as Ocean Magik. This product incorporates a blend of several species of algae that actually nourish phytoplanktivorous aquarium animals (such as many corals, clams, sea cucumbers, etc.) as they sequester nutrients such as ammonia, nitrate, phosphate and silicate directly from the aquarium system water. In other words, Ocean Magik does not merely eliminate bad stuff; rather, it turns bad stuff into something very, very good. Perhaps most importantly, it does so in the most benign way possible. And, when the job is done, the flourishing algae is happily consumed by a very wide variety of aquarium creatures such as copepods (which, incidentally, put even more pressure on heterotrophic varieties of dinoflagellates by competing for organic waste products). Problem solved!